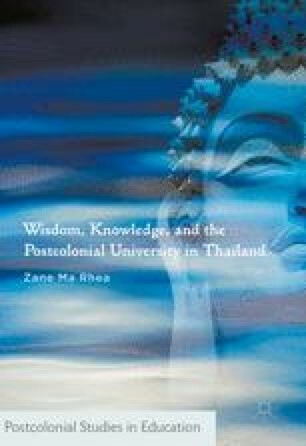 This chapter speculates about the potential of individuals and universities in Thailand and beyond, operating with awareness of global education services markets in langsàmǎimài postmodern society, to find value in a balance of local and “outsider” knowledge that supports the cultivation of modern wisdom. In Thailand, while there is a policy level recognition of this need, it has proved difficult to implement in a systemic fashion. This situation speaks to the powerful, corrosive influence of education services markets in their driving the global provision of higher education towards homogenisation. It also speaks to a sense of uncertainty among Thai senior higher education policy makers in how to operationalise their national “common assets”, Buddhism and rural wisdom to name two strong cultural assets, across their higher education system.